At 27 years old, I had only ever dreamt of catching a grander. It was a maybe, possibly, sometime, hopefully by 50 kind of dream. Truthfully I was hoping to land one before the age my father was when he first caught his. Maybe never. Like anyone that loves the sport of bill fishing, the stories of the giants are what move us. The possibility that we may one day simply see a fish that size is titilating. In a million years, though, I never thought it could happen like this. But that’s the joy of fishing - great things will inevitably happen when you least expect them. A good friend of mine, and a phenomenal fishermen, Andy Moyes, and I went to South Africa this past October to celebrate our birthdays with a wild game hunting trip. 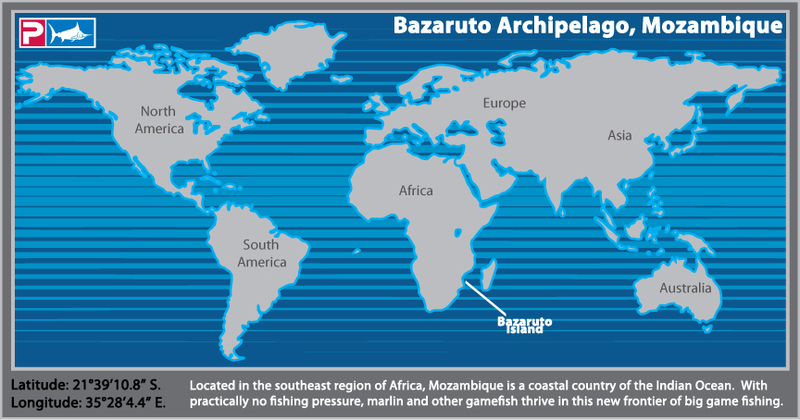 Kevin Hodgson, a good friend of Andy’s, invited us to fish off his boat in Mozambique while we would be in the region. 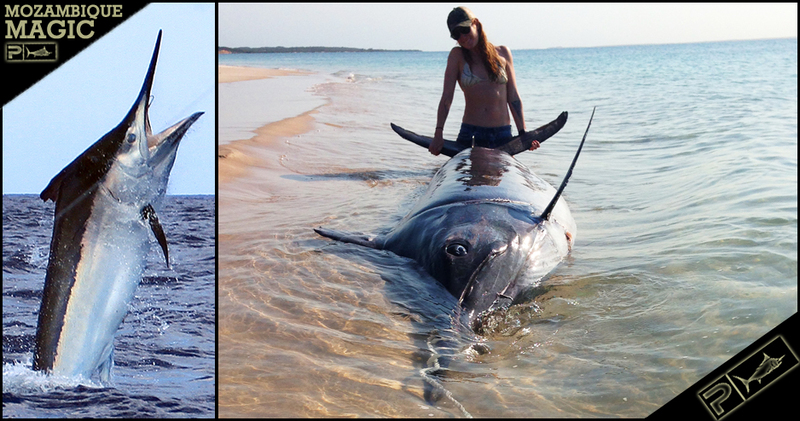 We had the hunt of our lives and then eagerly departed for Mozambique with hopes of catching my first black marlin. We boarded the mothership - a 73’ catamaran called the QuoVadis. Andy and I were welcomed on board by Kevin, his captain, Jason Holtz from Hawaii, and mate Spanky (Chris Pike) from South Africa. There are a few lodges in the area but because of the drastic tides and strong currents it is a gift to have a mothership vessel to come home to. Kevin’s boat, Big Bob, a custom 48’ sport fisher, was built for marlin fishing. He oversaw every part of the build and was set up with everything from a brine tank to the large tuna door that would later prove to be a tight squeeze. The second day of fishing was flat calm and beautiful. Only a few hours in and the right short went off. The fish smoked an Andy Moyes lure- a small green and black Kaiwi. It was a smooth transition, everyone working together to get lines cleared and I strapped myself in and started the fight. I was gaining when I could and the double line came up. Before we knew it, in true marlin fashion he took off and I was watching my spool and hard work run as far as it could. The fish grey hounded, finally jumping mid-air on it’s side, and I heard “that’s a nice fish” and “looking like 500….maybe 8”. We were all impressed with the fish and a little bewildered at how big it actually was. After he jumped the fight changed. He started acting like a big fish, erratic and determined. Jason drove the boat skillfully as we gained more and more but suddenly the fish was pulling much harder. After 30 minutes, I could tell he was tail wrapped because I stopped feeling movement in the rod and as we got the fish closer the rod tip bent over so unforgivingly I knew something was off. I was now up to full drag and holding the sides of the chair to not get pulled over since there was no safety line. The fish made this last major jolt which momentarily felt like the hook pulled, but we soon realized it was the line ripping into the tail fin a few inches. There was now zero action other than my groaning at the sheer dead weight of this fish. I haven’t ever had a billfish die on me before. I felt sad and relieved at the same time. Relieved because I knew we now had a plan of action to plane the thing up and end the torture of attempting to wench dead weight in. I do always love saying thank you and releasing any billfish to be caught again, but I had no say in that anymore. This one was now all ours, and we needed to get it in the boat. Jason watched me intently and knew when I was done reeling and needed to pull forward to create slack in the line so I could gain anything. It took about eight to ten major moves and after a total of an hour and a half, there the fish was. Jason then said, “this fish may surprise us boys”. Jason had caught eight granders before this, so I started getting nervous. We took some pictures from the boat, and started drinking or “yeasting" as they say in Africa. 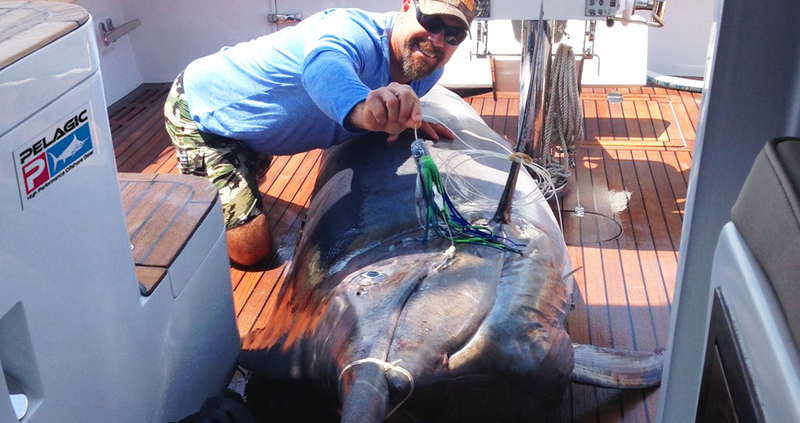 The Moyes “Kaiwi” lures hook was perfectly lodged in the corner of the giants mouth. Of course the big fish bit the smallest bait we had in the water, as big game fishermen say, "elephants eat peanuts". Back on the mothership, the sun was beating down on us and everyone was silent. Kevin zeroed out the scale and we starting seeing the numbers climb to the sound of the davit raising the fish out of the water. There she was hanging, and the final number read 1018lbs. Immediately Jason turned to me in excitement and threw me overboard. I came up starring at the marlin above me in utter disbelief that it happened. I caught my grander. We caught a grander. Champagne flowing and the excitement escalating, this was the perfect grander scenario - Captain Jason Holtz had now caught a grander in every ocean; Spanky now had a reason good enough to be away from the woman he loved; and Kevin was beyond proud to have had this experience on Big Bob - named after his late father whom we all knew was looking out that day. Below: The team poses with their grander before turning the fish to the locals to feed the area.